Family reunion photos. Are they work or pleasure? If the answer is yes to either question, you owe it to loved ones to take the lead and capture some precious memories when they are gathered together. Is it a chore to gather everyone for a group photo? We all want good photos but we sometimes pull back when around family we haven't seen in awhile. You need to me more aggressive than you want to be behind the camera, they are more humble and bashful than they normally are once the camera is out. How can you get fun, natural shots and give everyone an excuse to take photos together? An "old fashioned" board game can be the answer. Use any camera (smart phone, tablet or iPhone) and ADD any Photography Booth type props to the board game and away you go. SnapShotz puts taking photos together on "auto-pilot". Kids practically recruit family members to play. Simple and easy to play, it is designed so that people that love to take photos can mix it up with those that do not like to take photos. 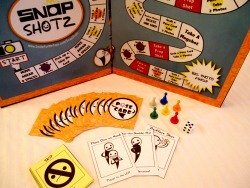 Learn more about the SnapShotz Photography Board Game on our "SnapShotz Game" button or order one today at our "Add To Cart" Button on the home page of SmileForMeToys.com. Like a reluctant child getting dragged to a birthday party and who later doesn't want to leave, SnapShotz will have that kind of effect on your relatives. The game is designed to help warm up the atmosphere and you will not regret placing it out for loved ones to play. Now you are ready for the "group photo!" Determine the best time to gather the frock for a group photo. Some like to early on when everyone is looking his or her best or later once the party has loosened everybody up. Bring a tri-pod or have a sturdy chair handy to stand on. Zoom in closely to their "eyes and smiles" of these sub groups which will help reflect their "closeness" in better photos. Take any group family photos from angles slightly higher to help reduce double chins. Once they are gathered, ask everyone to make his or her funniest face or pose. This loosens up the group and gets it out of their system prior to the serious photo being taken. 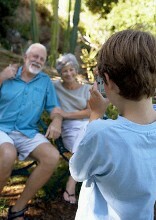 Family reunion photos are a great opportunity to capture some treasured family memories. DO NOT over do it. Relax have fun, put the camera down but do make the photos count when your camera is out. Share the photos and frame them as gifts, because photos help families bond and help to build a child's identity and self esteem. Good family reunion photos are a terrific opportunity.